Have fun splashing and playing in the Intex Mini Frame Pool. Approximate size: 48" x 48" x 12"
Dimensions: 62.5L x 62.5W x 19.5H in. 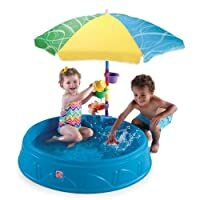 Inflated Dimension: 40" x 35"
Enjoy this cute baby pool with a built in shade and cool off from the summer heat! 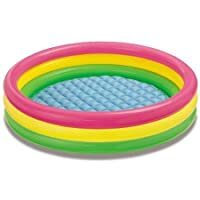 Designed with a sunshade and soft inflatable floor for extra comfort. 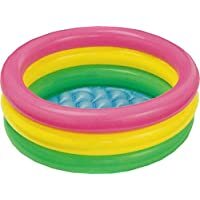 Contents includes 1 splash mat, 1 inflatable dolphin. 1 inflatable whale slide, 4 inflatable starfish rings and 1 repair patch. Material: European Standard 0.6P PVC. 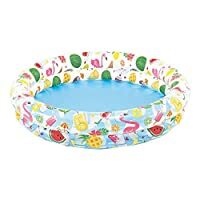 Baby Pool - Giant Infant Pool - Measures an Impressive 64" X 41" X 9.8"
Dimensions: 90" x 58" x 18"
Inflated dimensions: 75" x 20"